History will be made this summer when Pinehurst Resort & Country Club hosts the 36-hole match-play final of the 119th U.S. Amateur Championship on two courses. When the 2019 championship begins on Monday, Aug. 12, Pinehurst’s Course No. 2 and Course No. 4 will host the stroke-play rounds, which will be played over two days and 36 holes to trim the field from 312 players to 64 for match play. The first five rounds of match play – through the semifinals – will be played on Course No. 2 on Aug. 14-17. The championship match, scheduled for Sunday, Aug. 18, will open with the morning round on No. 4, which was recently redesigned by Gil Hanse. The afternoon round will be played on Course No. 2, a classic Donald Ross design that was restored by Bill Coore and Ben Crenshaw in 2011. It will be the first time the 36-hole U.S. Amateur Championship final is contested over two courses. It will also mark the second groundbreaking collaboration between the USGA and Pinehurst in five years. In 2014, Pinehurst hosted the U.S. Open (won by Martin Kaymer) and U.S. Women’s Open (won by Michelle Wie) in consecutive weeks on Course No. 2 – the only time the same course hosted those two championships in back-to-back weeks. The 2019 U.S. Amateur will be the 10th USGA championship contested at the resort. Pinehurst No. 2 first hosted the U.S. Amateur in 1962, when Labron Harris claimed the trophy over Downing Gray, 1 up. The resort’s Course No. 2 most recently hosted the championship in 2008, when Danny Lee of New Zealand earned the title with a 5-and-4 victory over Drew Kittleson. Many of the game’s greatest players have claimed the Havemeyer Trophy in the 118-year history of the championship, including Bob Jones, Arnold Palmer, Jack Nicklaus, Phil Mickelson and Tiger Woods. The Carolinas will serve as the epicenter of USGA championships in 2019, with four events scheduled between the Tar Heel and Palmetto states. 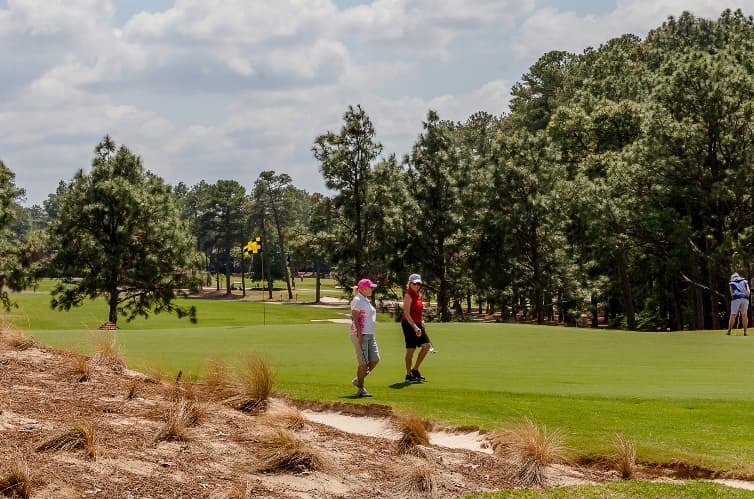 The U.S. Senior Women’s Open kicks off the competition at Pine Needles Lodge & Golf Club in Southern Pines, N.C. (May 16-19), followed by the U.S. Women’s Open at the Country Club of Charleston (S.C.) (May 30-June 2), the U.S. Amateur at Pinehurst (Aug. 12-18) and the U.S. Senior Amateur at Old Chatham Golf Club in Durham, N.C. (Aug. 24-29). Tickets, including U.S. Senior Women’s Open/U.S. Amateur combination offers, are available at the USGA website.